There are over 250 different kinds of cold viruses! But rhinovirus is by far the most common. With over 100 different varieties, rhinoviruses are responsible for about one-third of all colds. Rhinovirus is particularly active during the fall and winter months. Why? Because rhinovirus loves the low humidity. Also, when the humidity is low, your nose dries out and is more susceptible to infection. But, despite what many think, studies show that one thing that doesn't cause a cold is the cold! The best thing you can do to reduce your cold-catching chances is to wash your hands properly and often. Rhinovirus can survive three hours outside of the nose. If the virus gets on your hands and you rub your nose, you've caught it! What can you do if you get a cold? Not much. Antihistamines and decongestants can help relieve the symptoms of a cold. But antibiotics only work against bacteria and not against viruses. So get plenty of rest and drink lots of fluids – and play with your GIANTmicrobes! In the United States, the common cold leads to some 100 million physician visits annually at a cost of over $8 billion annually. Americans spend billions on over-the-counter drugs and another huge amount on prescription medicines for symptomatic relief. 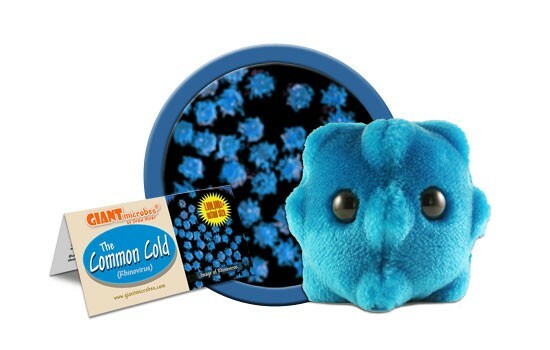 And here’s another amazing fact: the very first product introduced by GIANTmicrobes over 15 years ago was the Common Cold!